Beader's Resource, Inspiration & Products, Misc. Today I’m going to give you a helpful guide of the basic tools that all jewelry makers should have in their arsenal! Some tools that you may think are geared just towards one type of jewelry-making can certainly come in handy for other types as well! Let me give you my own personal run-down! First, it should be noted that not all tools are created equally. For example, you can have 3-5 pairs of Round Nose pliers in front of you and they can all be a little different in style, size, and quality! Differences such as the size of the jaws, the size and grip of the handle, the quality of any spring mechanisms that assist with easily opening up the pliers… all of these things should be taken into account when purchasing. I recommend starting with a middle-of-the-road quality of pliers. (I’m using the same pliers that I purchased 10+ years ago!) If you take care of them, they will last for many many years. A middle-grade pair of pliers such as Round Nose pliers, Chain Nose pliers, Flat Nose pliers, and Side Cutters will run around around $6-$10 per tool depending on the manufacturer. Other tools that have have different specialities may run you a little more in cost but can necessary to invest in. Depending on what type of jewelry you make, items like a Crimper tool (or a Micro Crimper tool), Flush Cutters, or Memory Wire Cutters may be really helpful to own even though they come at a slightly higher price-point. **The right tools make ALL the difference. ** They can make your work go more efficiently and smoothly. The wrong tools (or wrong quality of tools) can make your job much much harder and slower. Round Nose Pliers: These are used for creating loops and swoops! Any round shapes can be created by wrapping metal wire around the jaws of these pliers – which are like 2 ice cream cones (no flat edges!). You won’t want to use them for gripping things as their round shape can often leave dents in your wire if used to hold something tightly. If you try to use them for opening things like jump rings, you will slip all over the place since the lack of flat edge means they simply aren’t meant for such a task. Flat Nose Pliers: These pliers are flat inside and come to a square tip. They do not taper like their “cousin” the Chain Nose Pliers. These pliers are also great for gripping metal wire and making nice sharp bends. Never a bad idea to have a pair handy! Side Cutters: These are used for cutting metal wire like Sterling Silver Wire or craft wire! A nice new pair will also cut flexible beading wire like Soft Flex quite nicely, though I recommend having a separate pair for that since the stainless steel in the beading wire can dull your cutters over time. When the wire is cut it’s because it’s pinched, so you’ll be left with a tiny tapered cut to your wire. Flex Wire Cutter: This really is the tool of choice for cutting flexible beading wires like Soft Flex. It’s never a good idea to use your Flex Wire cutter to cut harder wires (like Sterling Silver ot craft wire) since they will dull your Flex Wire cutters over time and not give you as clean a cut when you’re snipping off your Soft Flex. Flush Cutter: This is a great tool if you do a lot of wire working. Unlike Side Cutters, which cut a wire by finely pinching it, Flush cutters leave a flush end to the cut surface. This can take care of some of the work if you were previously using a regular side cutter and needing to file down your ends for an intricate wire worked project. Crimper Tools: This is the tool to own if you want to do any stringing work. Previous to its creation, we simply used Chain Nose pliers to squish our crimp beads but with the invention of the Crimper Tool (a 2-step crimping process) we now have a much more secure way of constructing our necklaces and bracelets!! (I also love using the crimper tool to help tuck in any sharp edges what I’m doing my wire-wrapping!) The standard Crimper Tool is used with 2mm crimp beads. 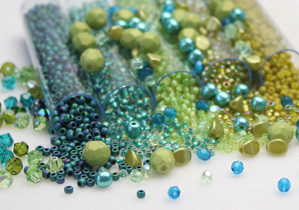 We carry the tools above, PLUS MORE, on our website: Eureka Crystal Beads! And, as an additional tool resource, you can check out the following link to a tool directory that we have listed on our website that will give some additional helpful information! You can expect our selection of tools to keep growing, so make sure to check back often! Previous Post Back to Basics: Crimping! Next Post Beaders Wax – What is it and why do I need it?